Heat oven to 400°F. Grease 9-inch pie plate. Heat 1 inch salted water to boiling in medium saucepan. Add broccoli; cover and heat to boiling. Cook about 5 minutes or until almost tender; drain thoroughly. 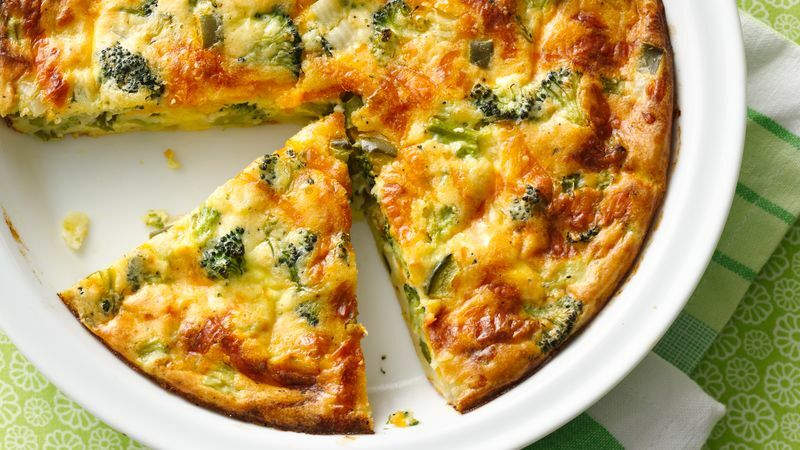 Stir together cooked broccoli, onion, bell pepper and cheese in pie plate. Bake 35 to 45 minutes or until golden brown and knife inserted in center comes out clean. Cool 5 minutes. Grab a 10-ounce package of chopped broccoli or cauliflower from the freezer. Use it instead of the fresh broccoli or cauliflower; it doesn't need to be boiled. Just thaw, drain and add it to the pie. For an Impossibly Easy Spinach Pie, use 1 package (10 ounces) frozen chopped spinach, thawed and squeezed to drain, for the broccoli; do not cook. Omit bell pepper. Substitute Swiss cheese for the Cheddar cheese. Add 1/4 teaspoon ground nutmeg with the pepper. Bake about 30 minutes.